By Jason Knott · June 2, 2015 • Using Apple HomeKit, Lutron Caséta wireless lighting and Serena shades, via Smart Bridge home automation gateway, can now be controlled using Siri voice commands. By Julie Jacobson · April 13, 2015 • Now that Apple Watch is shipping, home automation developers like Savant, Lutron, Crestron, Honeywell and Alarm.com are rushing to finish their apps and enjoy the hype of WatchKit and the new wearable craze. By Julie Jacobson · January 1, 2015 • Lowe’s Iris, Staples Connect and home automation standards top the list but who garnered the most page views on the custom side? 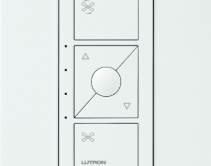 By Julie Jacobson · December 16, 2014 • Two-way control modules for Lutron Caseta, Aprilaire thermostats, DSC security systems and Fusion Ovation music streamers added to URC driver library. Sonos is coming "very soon." By Julie Jacobson · November 5, 2014 • Honeywell thermostats, Lutron Caseta lighting control, door locks at Starwood hotels will be controllable through Apple Watch. The smart watch category is heating up for the smart home. By Julie Jacobson · July 1, 2014 • Wink’s 24/7 tech support, product packaging, device discovery, real-time diagnostics expected to drive home automation sales; works with Android Wear. By Julie Jacobson · June 30, 2014 • The original $99 Staples Connect home automation hub by Linksys drops to $49, with a new $79 option from D-Link coming with ZigBee and Bluetooth; Win 8 and Samsung TV apps added to platform. By Julie Jacobson · June 26, 2014 • Home Depot to sell new home automation Hub from Quirky’s spinoff business Wink; Hub supports Wi-Fi, Bluetooth Smart (BLE), Z-Wave Plus, ZigBee and Lutron’s Caseta wireless protocol. By Julie Jacobson · December 30, 2013 • In 2013, Lutron launched RF products for DIY, Internet of Things for the smart home took off, Control4 went public, 6 top dealers formed Via, Plasma died, 4K Ultra HD thrived, hacker bots disrupted home automation.